Which is better granite, tile or hardwood? Most of us prefer the beautiful wooden look on our floors. In fact, the look tends to be rich and innovative and possibly hard to beat with any other alternative. However, there are several issues associated with the type of flooring. What are the issues you would face and why granite or plank tiles are a better option? We will check it out in the following paragraphs. Why is granite and plank tile flooring is better than hardwood? Hardwood is indeed the best option for the flooring. It provides you access to the best performance and ambiance. However, the maintenance can be a huge issue if you are opting for the hardwood. Especially, the kitchen can be an issue where you may face problems related to water, or if you have a pet — like a dog — you run into the risks of scratching. Why is granite or tile a better option? Here are four reasons. In sharp contrast to hardwood, porcelain plank tiles, granite or other tiles can be helpful in resisting water effectively. If you want the look, you can opt for the granites or tiles that offer you a similar look as of the hardwood — but with an added security. If you are in Florida, Opustone Florida can be an excellent option for checking out such tiles. Since the material is directly adhered to the floor, it will provide you with access to a solid and dense look and functionality. In fact, it will not absorb water and also is resistant to stain. It should be an excellent option for the kitchens and outdoors as these are the areas that are susceptible to pets and water. One of the advantages of wood flooring is it lets you choose different colors and options to suit the kind of person you are. They can indeed be helpful in creating an innovative look for your floors. However, when it comes to the tiles and granites, the options you have is practically unlimited. The tiles provide you access to a huge range of options in terms of colors, textures, and styles. Right from the cooler grey options to the more darker shades — the possibilities with the tiles are just endless. The wood-like appearance will add up to the value of the exotic appearance of the flooring. Wood looks good and provides a natural appearance to your floors, but by virtue of its soft nature — it is bound to be an issue maintaining it. It can easily develop dents because of the movement of the furniture or can be scratched. On the other hand, tiles and granites can be a better option if you are looking for durability. They are practically unbreakable if you are opting for proper installation. You can move even the heaviest of the furniture on the floor and find the flooring intact. Let your dogs or any other pets move around freely on the floor without damaging the flooring in any manner whatsoever. The tiles that share the appearance of the hardwood have indeed become part of the new style statement. This is the most popular tile option in particular and flooring option in general. The fact that you will find a wide range of colors, textures, and styles will translate into making your floors stand out from the rest. It should be even more important to note that you can check out the options for the right kind of colors for your exact needs. This is something that may not be possible with the hardwood flooring. You can check out the options in pure and cooler shades or even the bright whites depending upon where you will be installing them. Now that you are aware of the advantages that granites and tiles can have on the solid hardwood how about checking out a few options with respect to the best granites or porcelain tiles to decorate your tiles? One of the best options that can be installed practically anywhere and on any surface, it should be an exceptional choice for your floorings if you want to make it stand out from the rest. Of course, it may need more floor preparation, but the end result should be one of the prominent options you would want to go with. Check out your options and share your thoughts with us. 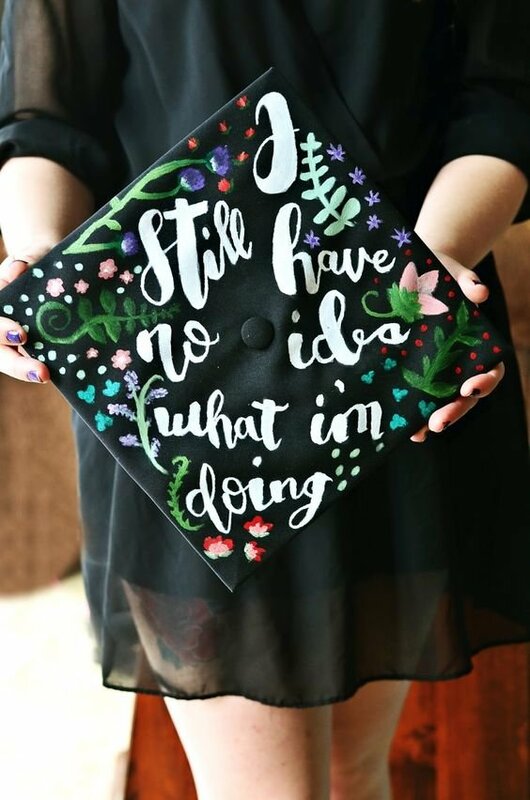 Before you go into a mental breakdown or existential adulting crisis, here are some graduation cap ideas for English Majors. Graduation is approaching soon and you know what that means — senior pictures, endless amounts of stress balls, figuring out what you’re going to do after college, sending in graduate school applications, and starting a new chapter in your life. You know, the usual norms. 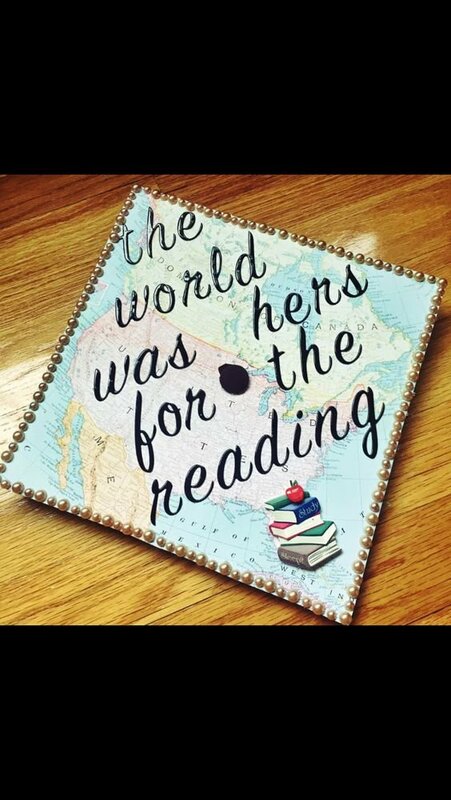 But before you go into a mental breakdown or existential adulting crisis, here are some graduation cap ideas for English Majors. From one English Major to another, we gotta stick together. The cursive backdrop looks like it came out of an actual book. The flowers and the combination of pearls/gems add a nice touch to the vintage side of English Majors — what could be more lit than this? 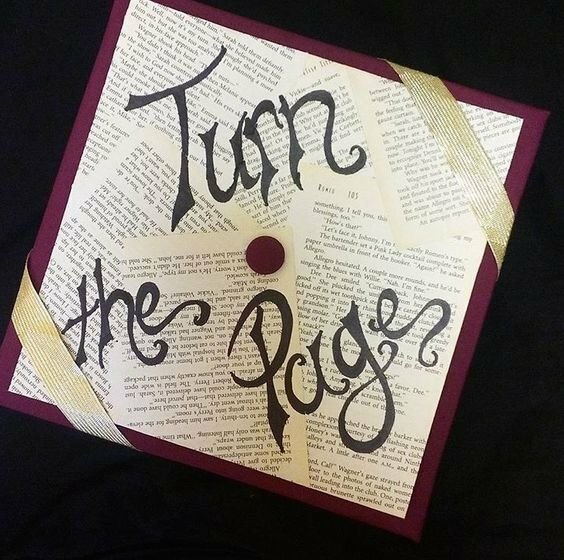 Now this graduation cap is the definition of literary genius. They used pages out of an actual book and neatly draped them, kind of looks like that scene in the first harry potter movie where harry’s mail floods the house. 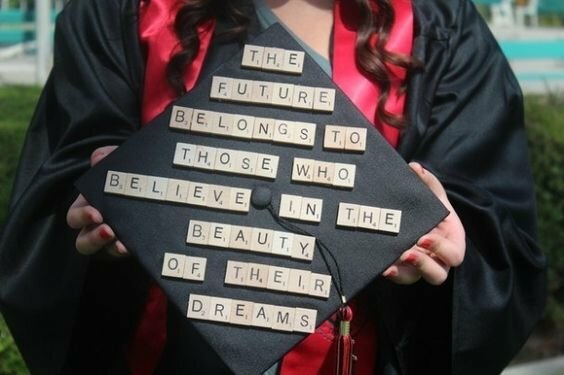 If you have lots of patience, LOVE Scrabble, and have lots of hot glue in your glue gun, this is the graduation cap for you. 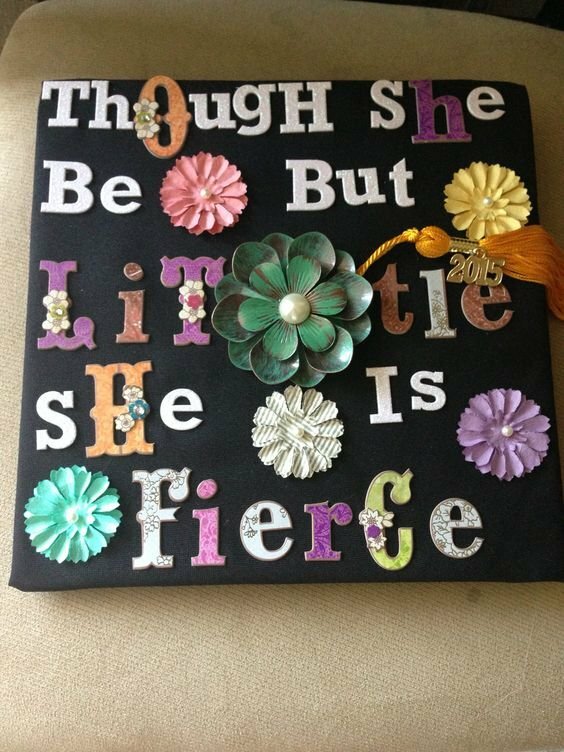 Slightly feminist, yet slaying graduation cap. And that map with the pearl beading framing, so elegantly attractive. 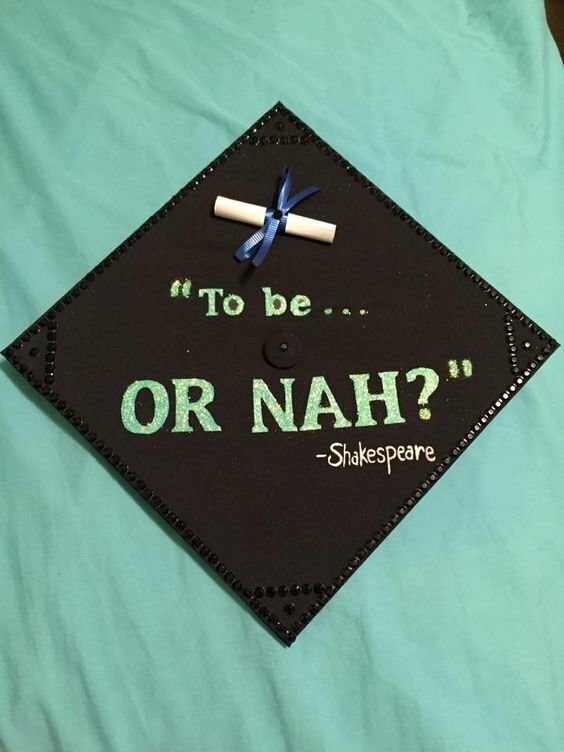 What doesn’t say English Major more than Shakespeare!?! 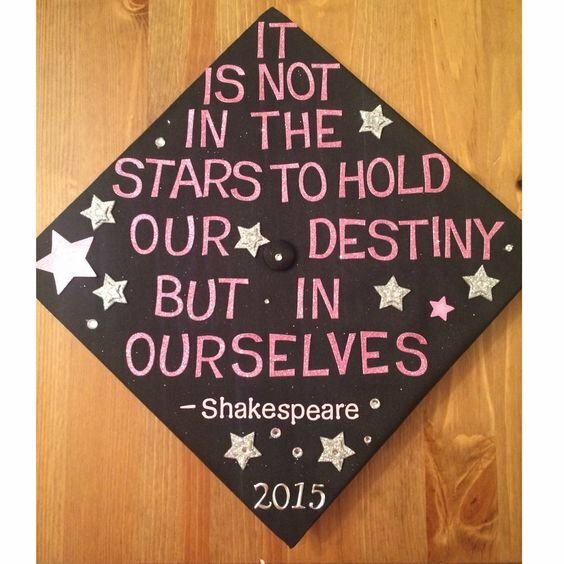 If you want to add some Shakespearean flair to your graduation cap, look no further than A Midsummer Night’s Dream. 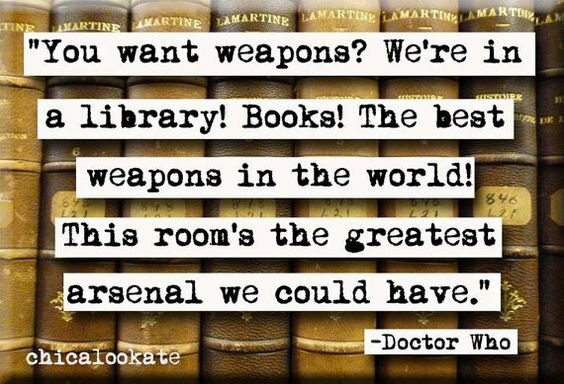 You go Dr. Who, you go. Some words of wisdom. You are one step closer to that light at the end of the tunnel. 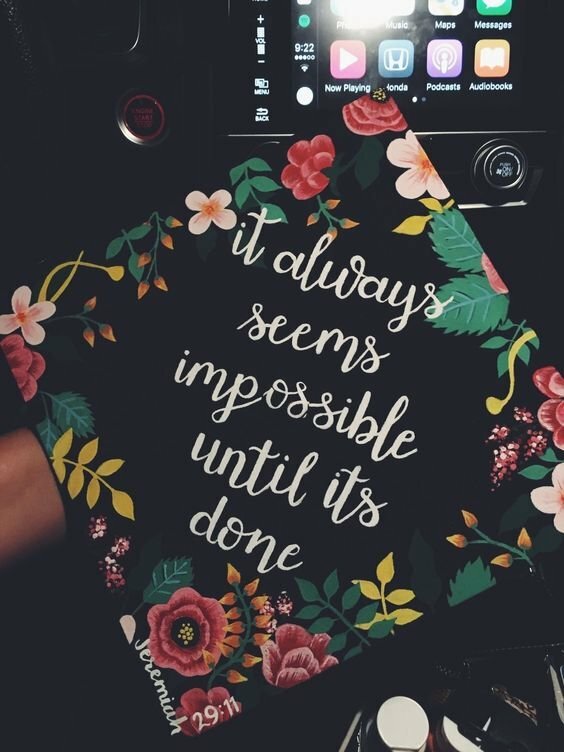 You got this! Don’t lie, we all have contemplated this at some point during the semester. Hey, you got your degree. That’s all that matters. 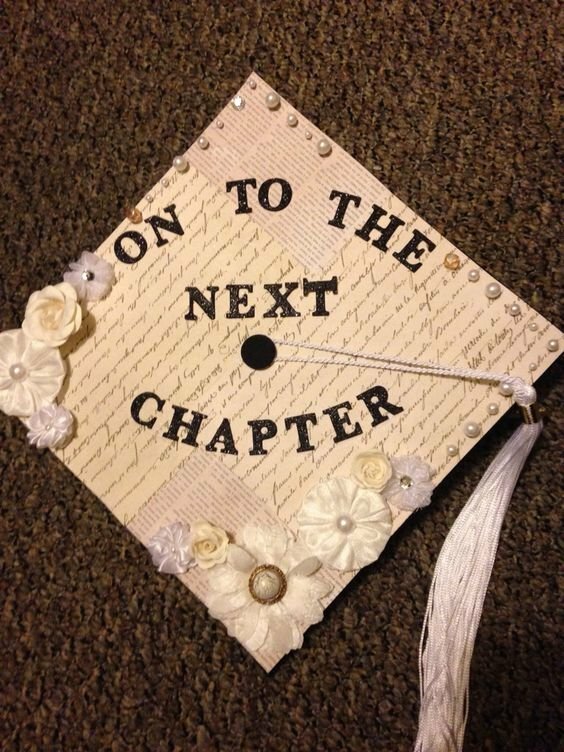 Hope these graduation cap ideas help you English Majors or anyone who’s a fan of the literary field. In the end, be proud of yourself — you survived four years of endless cramming, late nights, a plethora of mental breakdowns, and endless amounts of caffeine. Give yourself a pat on the back and treat yo’self! Now that you’re at the end of my article, get back to hitting the books, English Major! Things are about to get “lit” quicker than you think! !